On Saturday night, I was lucky enough to attend the Philadelphia International Antiques Show World Collectors night. Held at Philadelphia’s historic Naval Yard, this event was fantastic. Co-sponsored by Anthropologie, the event catered to a younger crowd and featured a map that could be stamped by participating booths which would put you in the running to win a prize at the end of the night! Not unlike the Young Collectors Night at the Winter Antiques Show in NYC, this event is in the evening, and allows people to peruse antiques while sipping cocktails. The building at the Navy Yard was absolutely fantastic. Such a perfect open space with beautifully high ceilings. Ok I may or may night have gone overboard with the antique pictures, but I just want to give you all a sampling of some of my favorite pieces of the night. I loved this drop leaf table with the scallop detailing. My horrible photo does not do the patina of the wood any justice, it was just beautiful. I am always a sucker for a slant top desk, and this one was especially beautiful. I have a miniature obsession with these corner chairs. Re-upholsterd in something a bit brighter, this classical chair would seem almost modern. Such a beautiful set–and with the original paint still on the seats! W loves these, so mostly I took this picture for him, but I could see this fitting in with many of Amelia Handegan’s interiors from last weeks post. I had an extremely emotional reaction to this piece. I absolutely love it. I am sorry I didn’t take more detailed photographs, but there is an amazing greek key motif at the top of the bookcase that is so stunning. The back of the cabinet is made of painted bead board, some at least 16 inches wide. I stood and talked with the dealer for quite some time about this piece, and we discussed the fact that for a piece of this age, it is extremely large and tall! One would need a very large room to accommodate such a large piece of furniture–and we all know I don’t have the space! 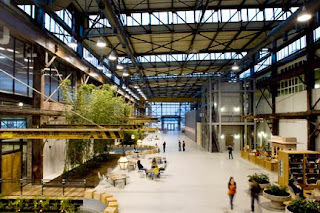 Finally, the after party was held in the Urban Outfitters Executive Campus, in the most amazing building. I couldn’t get over the fact that this is where people work! A perfect example of an adaptive re-use project. And what a great party! Can’t wait until next year when I can add more multi-thousand dollar antiques to my wish list!